The good news all Royal Enfield Himalayan fans have been waiting for so long is finally here. Royal Enfield has launched the Himalayan today that is on March 16, 2016. Royal Enfield has finally entered the Indian two-wheeler market with an aggressive price point of INR 1.55 Lakh (ex-showroom, Mumbai) and INR 1.78 Lakh (On-Road). Earlier the bike was not being sold in Delhi City and the reason given to us was that the Himalayan is not BS4 compliant. However, the Himalayan was available in the NCR region like Gurgaon, Faridabad, Ghaziabad and Noida at a price of INR 1.79 lakh (on-road). Royal Enfield has finally launched the BS4 compliant version, which should be ready to go on sale by 1st April 2016 at INR 1.73 Lakh. 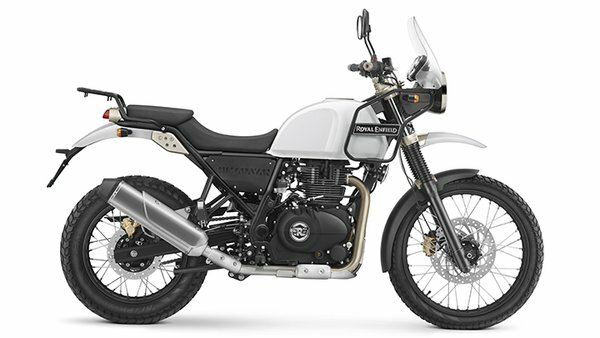 Royal Enfield has now unveiled everything about the Himalayan in its brochure and now the much anticipated Royal Enfield Himalayan seems all set to hit the showrooms. Earlier in the month of February, Royal Enfield had sent out an invite for a press conference to officially unveil the Himalayan in the presence of Siddhartha Lal, MD & CEO Eicher Motors Limited. You can watch the full event in the video below! The Himalayan has been tested extensively on rally stages in the Himalayas that would destroy most vehicles. However, the Himalayan proved to be capable of taking a thorough beating without any serious side effects. Royal Enfield Himalayan comes in two trims – the standard version and the adventure tourer. While basically there is not much difference between the two variants, the latter comes equipped with a number additional fitments and accessories that make it an ideal adventure tourer. Talking about the exteriors, the Royal Enfield Himalayan get a half-duplex split cradle frame and comes in two colour tones- Snow White and Granite Black. The front end of the bike comes with classic round headlamp and a long tourer style visor along with high raised handlebars and round mirrors. You’ll all see a nicely designed beak and long travel suspensions. The bike comes with a two piece seat and an extended carrier at the back along with a mount for side dickey. On either side of the fuel tank, we can see plastic containers coloured in red which can be used to carry water or fuel during long journeys. The Himalayan is, 2190 mm long, 840 mm wide, 1360 mm (flyscreen top) tall, has a wheelbase of 1465 mm, a ground clearance of 220 mm, a kerb weight of 182 kgs and has a seating height of 800 mm. On the mechanical front, the motorcycle gets a 4 stroke, SOHC, 411cc single-cylinder, air-cooled engine with overhead cams, coupled with a 5-speed constant mesh gearbox, producing 24.5 BHP (18.02 KW) @ 6500 RPM and 32 NM @ 4000 – 4500 RPM. The bike has a fuel tank capacity of 15 litres. The designers of the bike have even gone ahead and safeguarded the engine with a skid plate and protection railings around it as seen in the pictures. The Royal Enfield Himalayan comes packed with, a pair of chunky off-road tyres, a high-mounted mudguard, two telescopic, 41 mm forks, (200 mm travel) forks at the front and a monoshock with linkage, (180 mm wheel travel) at the rear. 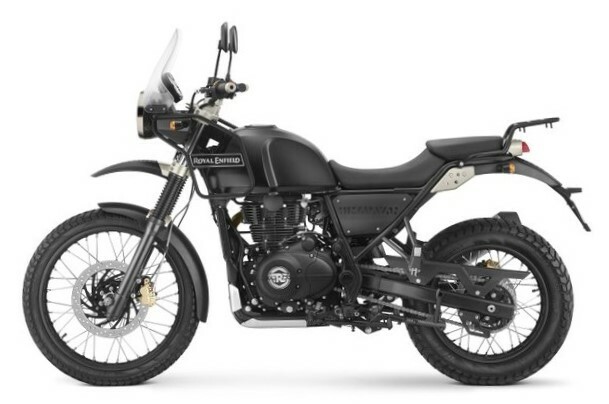 To make the Himalayan more versatile, Royal Enfield has given a 90/90 – 21″ front wheel and a 120/90 – 17″ wheel at the rear. Braking, on the other hand, is managed by 300 mm disc, 2-piston floating caliper brakes at the front while 240 mm disc, single piston floating caliper at the rear. Other features included in the Himalayan are, wind and rain shield over the headlamp, dirtbike-style chain tensioner, and brackets to mount luggage. 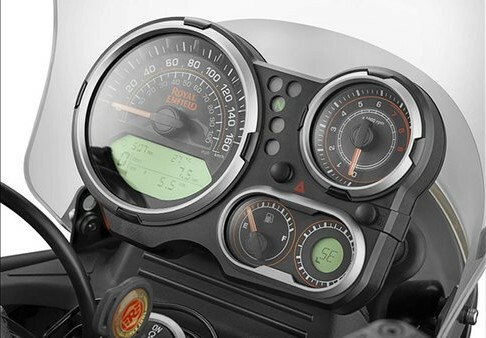 The instrument console will house an analogue speedometer, tachometer, digital display for clock, odometer, trip metre along with a compass and even an altimeter. Royal Enfield has finally entered the Indian two-wheeler market with an aggressive price point of INR 1.55 Lakh (ex-showroom, Mumbai) and INR 1.78 Lakh (On-Road). As far as prices go, the company intended to keep the bike under INR 2 lakh, which essentially makes it the best adventure tourer in that price range. To remind you, Royal Enfield has confirmed that the bike will not be sold in Delhi City and the reason given to us by it was that the Himalayan is not BS4 compliant. However, the Himalayan will be available in the NCR region like Gurgaon, Faridabad, Ghaziabad and Noida at a price of INR 1.79 lakh (on-road). As of now customers in Delhi will only be able to see the bike on display at Royal Enfield outlets but cannot purchase one. The company also said that it is working on the BS4 compliant version, which should be ready to go on sale by April 2017. The Royal Enfield Himalayan went on a 10-day tour across India from 12th Feb to 21st Feb, prior to launch on March 16. It was displayed at prominent malls with huge footfalls in Noida on 12th, Kolkata on 13th, Bangalore on 14th, Hyderabad on 19th, Mumbai on 20th and Chennai on 21th Feb 2016. In a series of videos published before the unveil, Royal Enfield shared some experiences gained while developing and testing the bike. In the first video, Josh- Royal Enfield’s test rider and CS Santosh – the only Indian to participate and finish the Dakar rally – were seen testing and commenting on their experience riding India’s first potent dual purpose machine at Big Rock Motopark, Kolar, Karnataka. In the video, CS Santosh rode the Himalayan on a terrain he is most comfortable riding on and seems quite pleased with the performance of the Himalayan. “I was surprised because I think it (the RE Himalayan) felt natural to be off-road as well. Just the way it was sitting between my legs it felt good because I’ve been used to rally bikes and it didn’t feel strange at all. For a common man, it will not be intimidating at all. The power is there but it’s not gonna be aggressive,” said Santhosh. In the video above, Lester Harris, Director Harris Performance Products, is seen talking about the suspension and engine specification of the Himalayan, while Sanjay Tripathy, former head product strategy, said that the service interval is 10,000kms for the engine while the spark plug needs to be changed every 25,000kms. Sachin Chavan, Head Rides and Community, said that his main focus was to set the right compromise between the seat height and ground clearance of the Himalayan, so he went for a 21-inch front wheel instead of the regular 19 inch. Royal Enfield tested two prototypes of the bike when the Royal Enfield Himalayan was in the R & D stage. The first prototype was fitted with a 750cc engine while the other one with a 411cc unit. During testing, Royal Enfield found out that the 411cc unit would be enough to power the Himalayan. The test mule with the Long Stroke 411cc overhead cam engine which produced 25hp power was eventually selected to power the Himalayan. The videos above shows the bike’s performance in terrains like River, Plain and Mountain respectively. Before its unveil, Royal Enfield also uploaded three animations with a tag line each. The first animation features a snow Leopard with the tagline “The Snow Leopard is next of kin. #Himalayan”. The next animation features a mythological “Chakra” (a wheel) with the tagline “The wheel of fortune favours the true adventurer #Himalayan”. The last one features the mighty Mt. Everest with the tagline “It’s not the mountain that we conquer, but ourselves. – Sir Edmund Hillary #Himalayan”. In the video above, watch Sachin Chavan, Lead – Ride Experience, test the prototype of the Royal Enfield Himalayan across a wide range of terrains and weather conditions in the Himalayas during intense testing and development of chassis, suspension and engine performance. Don’t forget to watch the short official clip on the Himalayan Story below!